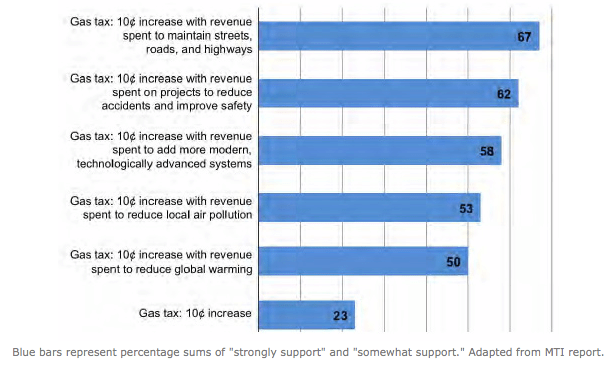 It’s taken as axiomatic at this point that attempting to raise gas taxes is political suicide, so we want to know what alternatives might be palatable to the American public, and whether gas taxes are really as anathema as they’re often portrayed. This encompasses basically every possible use of gas taxes, including some that are arguably illegal under current law, but Americans support it all when you actually tell them what it’s for. Most people, of course, aren’t aware that the Highway Trust Fund has been a net recipient of tens of billions of dollars over the last several years (or that there is a thing called the Highway Trust Fund, probably). But really, what do people think gas taxes are currently spent on? Medicare? Elsewhere on the Network today: Transitized explains why advertising by car companies is so deceptive. And Urban Milwaukee reports on the city’s demo bike-share station, which could lead to a 25-station system soon.